Why the obsession with moving to Mars? This is hugely expensive. NASA does not have the funds, so millionaires and billionaires are investing in the venture, and even India, which cannot feed its citizens, is putting in millions for a fly-by. With all this urgency, will Tito and his buddies wait until 2018, when Mars is next anticipated to be close? They plan to send up a series of habitable pods, to be installed by robots. Then the human inhabitants will arrive, or so goes the plan. Dennis Tito, the millionaire investment whiz who became the first paying passenger to visit the International Space Station in 2001, has worked out a plan to send two astronauts to Mars and back without stopping. However, the privately backed 501-day flight would have to be launched in 2018. The mission would involve a flyby of Mars with a free return back to Earth, without stopping. That type of low-energy trajectory requires a special set of orbital circumstances: The presentation says those circumstances exist for the 2018 opportunity but won't repeat until 2031. And who's going to pay for all this? Although there's no price tag attached to the plan, doing the mission seems likely to require billions of dollars. Tito may be rich, but is he that rich? Indian space scientists plan to send an unmanned mission to Mars by 2013 to look for evidence of life. The six-to-eight-month mission, likely to be launched in the next seven years, would cost 67 million dollars. The mission will study the chemical attributes of the Martian atmosphere and the planet's sub-soil and terrain. India plans to send its first unmanned probe to the moon in two or three years' time. India plans to send a spacecraft to Mars next year on a scientific mission critics say shows the government's skewed priorities when people lack electricity and safe drinking water. The Mars mission will raise questions about British aid to India. The sum of the programme is about a sixth of what it receives each year from Britain in aid. The spacecraft will orbit Mars to collect data after its launch in November 2013 on a frequently used rocket developed by the Indian Space Research Organisation. India has had an active space programme since the 1960s and has launched scores of satellites for itself and other countries. Certainly it is evident that the Annunaki lived there in the past, as the live mouse, goat skull, and child’s toy showing up on rover Curiosity’s images proves. There is water aplenty on Mars too, though it has been run underground by the Annunaki washing their ore in the past. 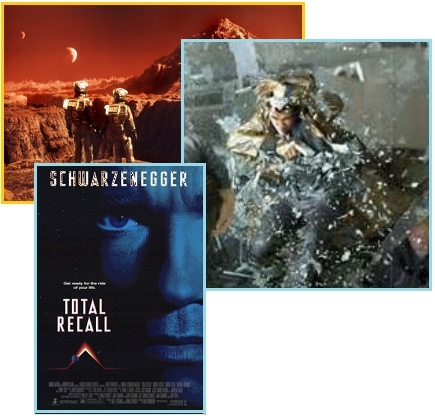 Might these billionaires be planning to terraform Mars, releasing the water to the surface so it can rebuild the atmosphere, similar to what was done in the movie Total Recall? The year is 2084. Douglas Quaid is a construction worker, every night Doug has been having horrible nightmares about the planet Mars and it has become very obsessive for Doug. There has been plenty of effort put into getting man off the Earth and into space. The pace is almost frantic. Take for instance the space elevator concept introduced in 2007, or the vertical pod Blue Origins has suggested. Grand Central Station to be replaced, presumably, by a platform up there above the clouds. What IS the rush to get off old terra firma? 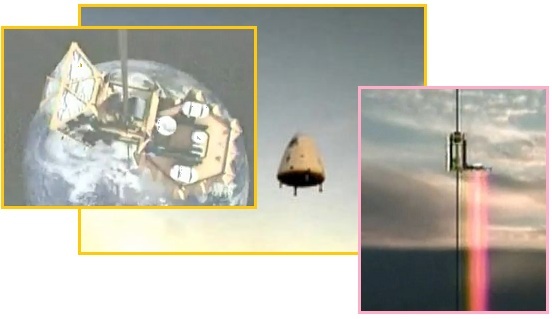 The era of private spaceflight is breaking new ground with the first test launch of the new Falcon 9 rocket by the company Space Exploration Technologies (SpaceX), which hopes to use the booster to fly its Dragon spaceship on space station trips. Here's a look at six companies vying for the future of human spaceflight. If we’re rushing to get into space and over to Mars at present, in the recent past we were spending billionaire funds to experiment with enclosed sustainable living. 30 million was invested in Biosphere 2 by a Texas billionaire. 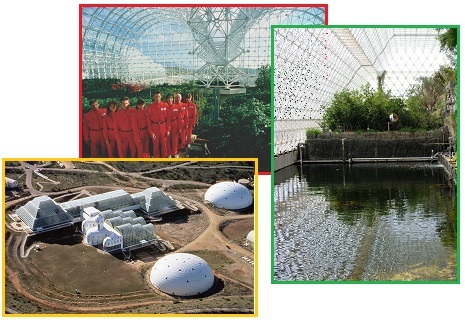 The Biosphere 2 project, conducted over 20 years ago, is still running experiments. Tito has enlisted the principles in his current rush to Mars. Seems all these projects funding by the elite, the super wealthy, are related somehow. The speakers listed for next week's news briefing include Taber McCallum and Jane Poynter, who are veterans of the Biosphere 2 life-containment experiment and the top executives at Paragon Space Development Corp.
Jane Poynter and seven compatriots agreed to spend two years sealed inside a 3-acre terrarium in the Sonoran Desert. Their mission back in the 1990s: To see whether humans might someday be able to create self-sustaining colonies in outer space. 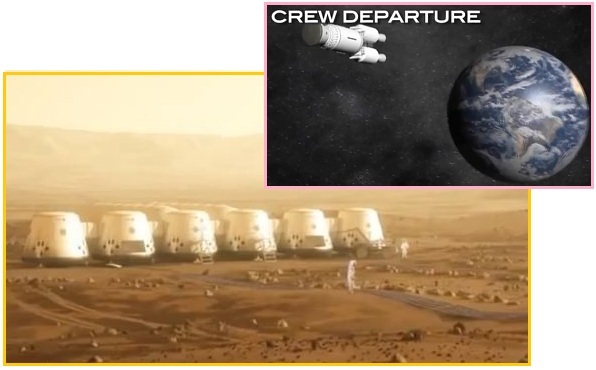 Per the Zetas, the elite will not be allowed to escape to Mars, though this has been their plan since they learned that Planet X, aka Nibiru, was due to arrive for another passage. From the start of the ZetaTalk saga in 1995, the Zetas have reiterated this prediction. The endless failures NASA and even the Russians have sustained notwithstanding, the billionaires are still pushing for a trip to Mars. The rover Curiosity on Mars has been allowed because it furthered mankind’s awakening, not because it furthered the elites desire to escape to Mars. ZetaTalk Prediction 1/15/1996: From its inception, NASA was attempting to secure, as much as anything, an escape from the forthcoming cataclysms. They still have that as a dominant agenda. The members of NASA and JPL who have been watching Planet X approach in accordance with our predictions some 50 years ago, have come to nervously accept that the reality of our exact predictions. They wish to find a safe haven during the shift itself. The thought of being on an Earth that will slip about with sloshing water and crashing plates is unsettling. They would like a vantage point on Mars, and from that when the rock and roll is over, they would settle down at the best looking agricultural setting in the world and walk off well prepared to take over as kings. This escape route would be for the elite of not only the US government and US military but other elites around the world. This is well disguised in talk about science research in the skies and exploring the universe, but this is all to camouflage the real plans which would be to take dozens and even hundreds of individuals away. ZetaTalk Statement 12/15/1996: As mankind is scarcely able to live in space, and has not mastered maintaining mankind in this environment, there are many obstacles to getting to and living on Mars in the first place. Thus, we hardly have to step in, as they are failing already! But should they appear to be succeeding, technological failures will occur. The series of mishaps that occurred in 1996 and accompanied the rush to place man on Mars are not accidents, as those at NASA are aware. When the phenomena of deformed frogs and the big die-off of frogs hit the news in the late 1990’s, the Zetas pointed to the roiling core of the Earth as to cause. This is the same cause for the rise in albinism, such as the White Buffalo of legend, first emerging in the late 1990’s. Human scientists were at a loss to explain either of these phenomena. Planet X was rapidly approaching the Earth, and roiling the core from afar. ZetaTalk Prediction 10/15/1996: Increasingly, as the core of the Earth adjusts to the approach of her brother, Planet X, this is reflected on the surface of the planet. Humans are aware of radio waves, x-rays, electro-magnetic fields, and gravitational tugs. This is but a tiny fraction of the invisible influences and all of them are affected by the approach of Planet X. Life at the moment of conception and at key points during development of the embryo where cell specialization or the inception of limbs and organs occurs, is delicate, and under more than the influence of DNA. 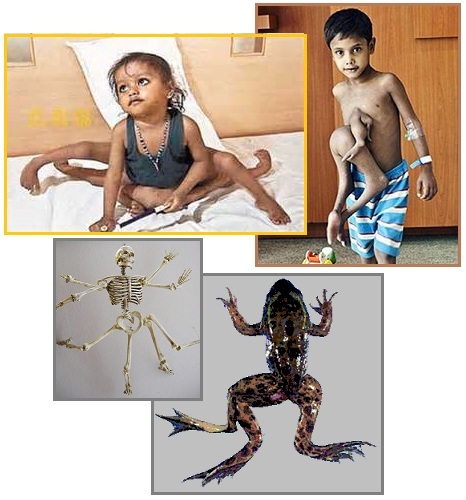 Look to what the drug Thalidomide did to the formation of limbs, where a chemical influence interfered with the message intended by the DNA, and children raised under high power lines developed cancer at an undue rate. As with white buffalo calves being born, deformed frogs, which will soon be appearing world wide, are heralding the approach of Planet X.
ZetaTalk Prediction 6/15/1996: The White Buffaloes are yet another harbinger of the coming pole shift. 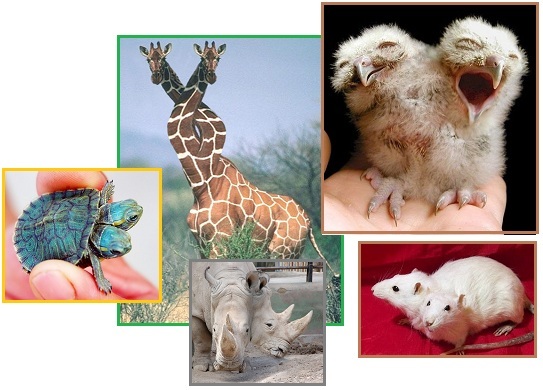 Albinos occur naturally in all life forms, some with more rarity than others. What causes an albino to emerge is assumed to be a genetic quirk, where the normal production of color compounds is suppressed. This is the effect but not the cause, else why would life in dark caverns or the depths of the ocean be pale, without color. Coloration is influenced by radiation, just as tanning takes place upon exposure to sunlight. The core of the Earth, emitting in greater bursts the radiation her caverns and deep water creatures are bathed in, is confusing her surface creatures. Thus, the White Buffalo, heeding the signals from the restless Earth, are heralding the approaching pole shift. Birth defects are now on the increase. One has only to follow the news to hear of two-headed animals or children with multiple limbs increasingly being born. Bicephalic or tricephalic animals are the only type of multi-headed creatures seen in the real world and form by the same process as conjoined twins: they all result from the failed separation of monozygotic twins. One extreme example of this is the condition of craniopagus parasiticus, whereby a fully developed body has a parasitic twin head joined at the skull. Supernumerary body parts are most commonly a congenital disorder involving the growth of an additional part of the body and a deviation from the body plan. Body parts may be easily visible or hidden away, such as internal organs. Many additional body parts form by the same process as conjoined twins: the zygote begins to split but fails to completely separate. 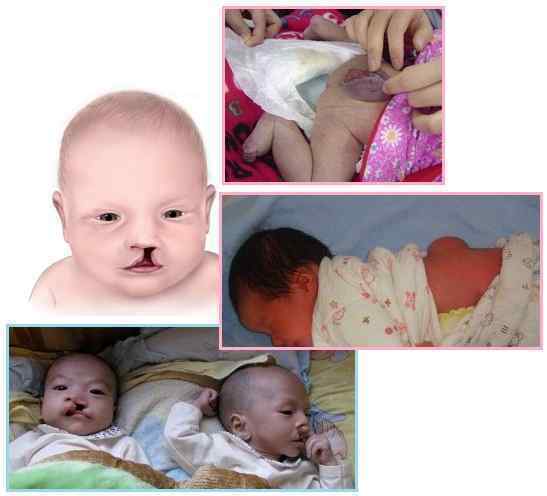 These are treated like curiosities, but there are an estimated 3,000 types of birth defects and most are painful tragedies - children born with cleft pallet, or as conjoined twins, incomplete spine such as spinal bifida, heart defects, or lacking a brain. Quality of life for the child and parents is destroyed. Yet these birth defects, as well as autism, are on the increase, and rising, during the past decade. Birth defects in China have risen 70% in the last decade. Birth defects now affect one in ten households in China. The number of birth defects among twins and triplets increased nearly two-fold in 14 European countries between 1984 and 2007, according to a new study. Researchers, who had information on more than 5.4 million births occurring over the 24-year period, found that congenital defects rose from about 6 in every 10,000 multiple births to about 11 in every 10,000 multiples. One in 50 babies has a birth defect as detailed new study shows numbers nearly double previous estimate. What is Causing the Increase in Autism Prevalence? 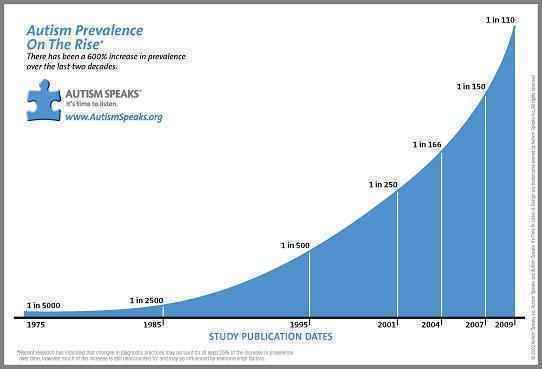 In the last two decades, autism prevalence as reported in the scientific literature has increased by more than 600%. The cause of the increase can be debated, but the increase is not debatable. Per the Zetas, this is not a time for babies, as the surging magnetosphere and the roiling core will not settle down anytime soon. Birth defects are physical abnormalities that are present at birth; they also are called congenital abnormalities. More than 3,000 have been identified. Environmental chemicals such as fungicides, food additives, and pollutants are suspected of causing birth defects, though this is difficult to prove. Exposure of the mother to high levels of radiation can cause small skull size (microcephaly), blindness, spina bifida, and cleft palate. How severe the defect is depends on the duration and timing of the exposure. Three viruses are known to harm a developing baby: rubella, cytomegalovirus (CMV), and herpes simplex. Toxoplasma gondii, a parasite that can be contracted from undercooked meat, from dirt, or from handling the feces of infected cats, causes serious problems. Untreated syphilis in the mother also is harmful. ZetaTalk Explanation 2/16/2013: Deformed frogs began appearing in the mid-1990’s. Sensitive to the emanations from the swirling core of the Earth, they were likewise dying in disturbing numbers. The establishment had no explanation. Since that time, birth defects in animals, where additional legs or heads appear, have increased, hitting the news. Albinism, also on the increase, is another symptom of the increased emanation from the core. The Earth’s interior is magnetic, and responds as does the magnetized crust of the Earth to the approach of Planet X, attempting to approach or escape during the daily rotation of the globe. We predicted that illness would be on the increase as the Pole Shift approached, due to depressed immune systems. But the stress of the increasing Earth changes during the cover-up have likewise created an increase in auto-immune reactions, a sign of a hyper active immune system. This is particularly devastating during pregnancy, when the mother can develop antibodies to the fetus, such as occurs in some cases where autism develops. The fetus is likewise taught to attack its own brain, as brain fragments are not recognized as normal tissue by the fetus’ immune system. Given the devastation that will soon occur to the Earth, our advice has been to avoid pregnancy, and to take steps to avoid accidental pregnancy when contraception is not available. It is not a time for babies. Yet another case of spontaneous human combustion has occurred, once again in an elderly, overweight, heavy drinking person. Documented cases are rare, only 200 or so cases documented in human history. 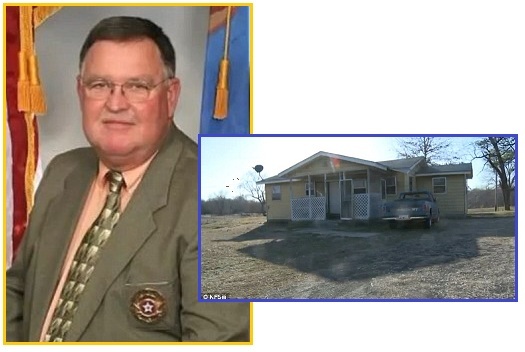 Sequoyah County authorities say a man who died in a fire at his home may have spontaneously combusted. Danny Vanzandt, 66, died in the blaze. Authorities say the man had a history of heavy drinking and smoking. Police believe a man may have died from spontaneous combustion after they found his burned body in his home but no other fire damage or evidence of accelerant use. A baffled coroner ruled last year that a man who burned to death in his home died as a result of spontaneous human combustion. Dr Ciaran McLoughlin, the coroner for West Galway in Ireland, said that although Michael Faherty, 76, had been found lying on his back close to a fire in an open fireplace, that blaze had NOT caused his death. In December 1956, Virginia Caget of Honolulu, Hawaii, walked into the room of Young Sik Kim to find him enveloped in blue flames. By the time firemen arrived on the scene, Kim and his easy chair were ashes but nearby curtains and clothing were untouched by fire, in spite of the fierce heat that would have been necessary to consume a human being. On July 2, 1951, Mrs Mary Reeser's remains, which were largely ashes, were found among the remains of a chair in which she had been sitting. Only part of her left foot and her backbone remained. Plastic household objects at a distance from the seat of the fire were softened and had lost their shapes. Per the Zetas, a combination of a genetic propensity and life style are necessary for spontaneous combustion to occur. It does not seem to occur at all in the animal kingdom. This is perhaps a product of the genetic engineering that occurred to promote conscious intelligence in early man. Fortunately, the human is not conscious during the burning process and does not experience pain. 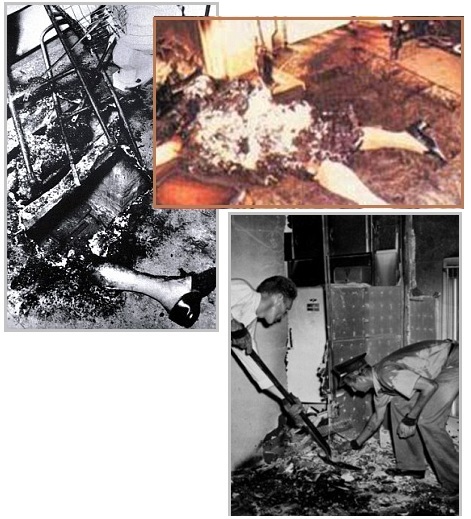 ZetaTalk Explanation 5/16/1996: Beyond what is normally present in the human body - oxygen in limited amounts and fuels - those who spontaneously ignite have inadvertently created their own cremation by fretting and eating, a combination that often occurs. If life feels out of control, then eat. Fat laden foods comfort the most, as comfort from banking against the cold of a long winter or lean times is built into the human animal. The more worry, the more chomping occurs, and under normal circumstances this simply results in obesity. However, worry causes the liver to flood the blood stream with a fine oil, readily lit, in case the body may need to take flight or fight. In some humans a rare genetic condition exists that allows the combustion of this fine oil to continue, unabated, when in combination with a type of adrenaline, the catalyst. The need for oxygen is bypassed, as a self-feeding chemical reaction starts where a byproduct of the catalyst- induced combustion incites combustion in neighboring areas, and the matter goes out of control. These humans, ostensibly fat and even jolly, are invariably found alone in their cremated state. This was a source of their self induced anxiety, as they chose to live alone, yet feared being alone, being their own worst enemy on all fronts. Does the human suffer? They feel no pain, as they become unconscious early in the process. A warm feeling, and then all goes black, as the brain is the first to receive blood from the pumping heart and brain cells are delicate. The unconscious and rapidly dying body, heart and breathing stopped, progresses to an intense chemical reaction, without oxygen, that is fast, hot, and very limited. The surroundings rarely burn unless highly flammable, as it is over too quickly to heat the air or raise the temperature of flame resistant furniture to the level where combustion runs unabated. Before the advent of flame resistant furnishings, spontaneous human combustion was not recognized for what it is. A spark from the fireplace or perhaps murder were suspected, but all clues were destroyed in the fire.